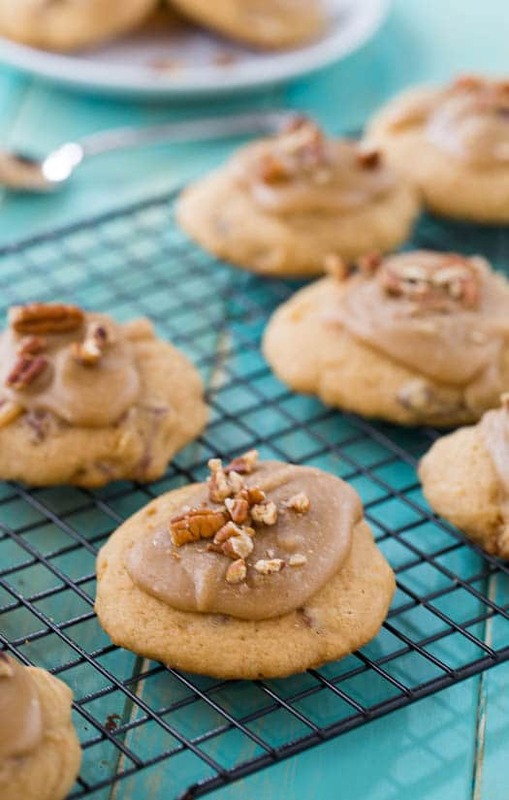 Caramel Frosted Brown Sugar Cookies consist of a soft, cake-like cookie topped with a rich caramel frosting and pecan pieces. There are little bits of crunchy pecan in the batter too. 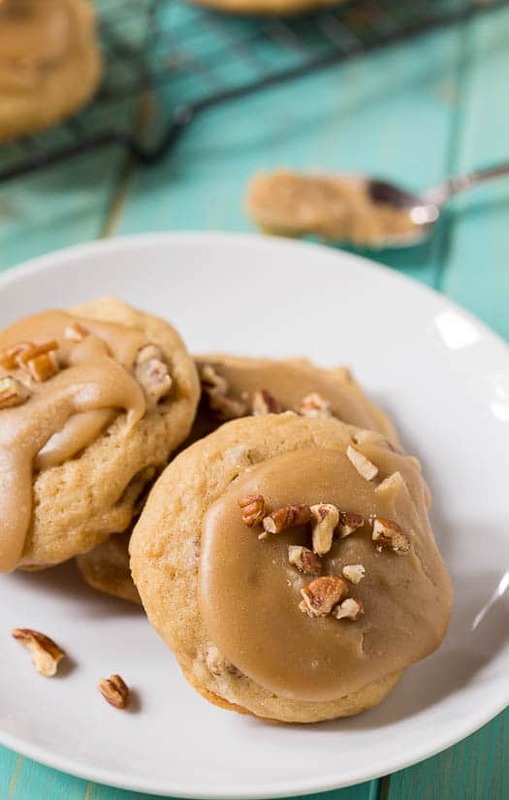 Caramel Frosted Brown Sugar Cookies consist of a soft, cake-like cookie topped with a rich caramel frosting and pecan pieces. There are little bits of crunchy pecan in the batter too. This is a recipe that I’ve adapted somewhat from Nancy Baggett’s The All-American Cookie Book . I love the contrast between the soft cookies with their simple, subtle flavors and the rich, sweet caramel frosting. Paired together they produce a cookie with just the right amount of sweetness. I think today will be our last stretch of warm weather for a while. Might finally be time to pack away the flip flops. Cold weather makes me want to hibernate in the house and stay in the kitchen with the oven on and bake away. Normally I’m more apt to bake pies or brownies. But I think this Holiday season is going to be all about cookies. I feel certain these Caramel Frosted Brown Sugar Cookies will make a few more appearances at our house this winter. They go wonderfully with a glass of warm milk or a cup of coffee. Preheat oven to 350 degrees and grease 2 baking sheets or line them with parchment paper. Sift flour and baking soda together into a bowl. Add salt. Set aside. Using an electric mixer, beat together the brown sugar and butter until fluffy. Add eggs one at a time and vanilla extract. Beat until evenly mixed, scraping down the sides of the bowl. Lightly beat in half of flour mixture. Beat in sour cream until blended well. Add remaining flour mixture and pecans and beat until mixed. Using a 1/8-cup measure cup or ice cream scoop, drop dough in even mounds on prepared sheets, leaving 2 1/2 inches between cookies. Lightly flatten the tops of cookies using your hand or the back of a spoon. Bake 1 sheet at a time placing in the upper third of the oven for 9 to 12 minutes. Edges should be turning light gold and center should be just barely firm. Let cool on pans for 2 minutes before removing to wire racks to cool completely. For frosting, melt butter in a medium saucepan over medium-high heat. Simmer butter, stirring occasionally until it turns slightly golden and smells very fragrant, about 3 minutes. Add brown sugar and cook 1 minute while stirring. Stir in hot water and corn syrup until well mixed and sugar dissolves. Vigorously stir in powdered sugar and vanilla extract until completely smooth. Add sea salt. Frost cookies before frosting sets and sprinkle with pecans. This entry was posted in Cookies, Desserts and tagged caramel, pecans. Bookmark the permalink. I candied the pecans on top and put on a bit of sea salt and loved this recipe! It was perfect and certainly a new favorite in this house. Made these this morning for a cookie exchange this evening, I saved some for my family to try and boy are they good! Hope they are a hit at the exchange! Thanks! I hope everyone loved them Pam!! I made these yesterday. They are awesome. Gave some to the neighbors, my mom, my boyfriend, and brought the rest into work today. Just making friends all over the place with these! Oh yea, gave each of my dogs a cookie and their tails wagged in delight. So glad everyone enjoyed them! But now I feel bad I didn’t give my dog one! These cookies! I want! The caramel frosting looks amazing – I think I could eat it by the spoonful! These are definitely my kinda cookie! Swooning over that caramel frosting and how soft and chewy these look! pinning. Your adaptation of Nancy Baggett’s cookie looks wonderful! 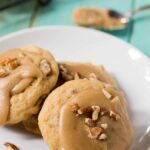 I haven’t evern been able to make a perfect sugar cookie so I appreciate perfection when I see it – these cookies with their sweet caramel frosting are a winner! These are so my kind of cookie! They sound fantastic!! And the weather – it was over 70 here yesterday and today I think the high is like 52 – it’s crazy! The cold weather does the same to me – I never wanna leave and I become a hermit. Haha! I will wear flip-flops right until the first snowfall thought. I hate socks and shoes LOL Love these cookies – the frosting looks to die for. These look absolutely amazing! Brown sugar and caramel=perfection. Pinned to try soon! YES please! 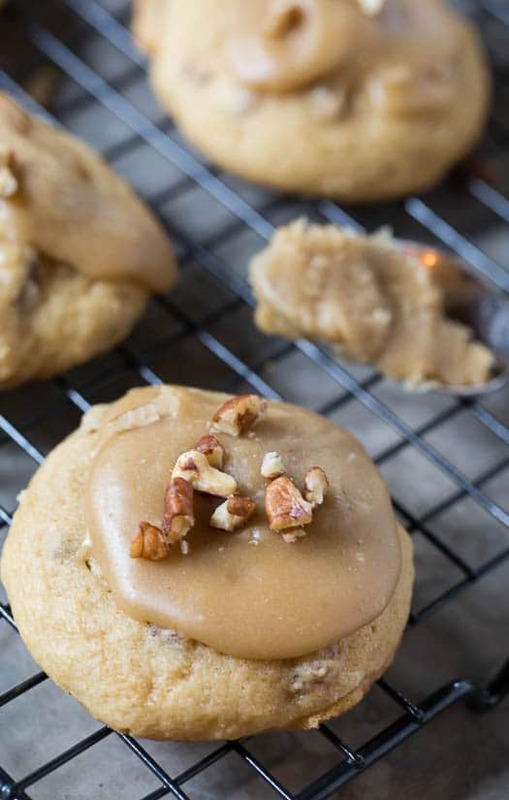 These cookies look incredible – so LOVE the caramel frosting and dusting of pecans! If there was a tray of cookies in front of me, in all kinds of flavours, I would pick this one! OMG these cookies are magical! I love the caramel and brown sugar combo. Perfection! Sugar cookies are my absolute favorite and these look like the best ever! I love your creativity, Christin! I’ve never had a brown sugar kind with caramel frosting, so I’m loving this. Pinned! These look like a wonderful addition to my ever-growing list of Christmas cookies I need to make. 😀 That caramel frosting is so smooth and creamy! Love these cookies, Christin. The flavors in these cookies sound incredible, Christin! Love these…pinned.